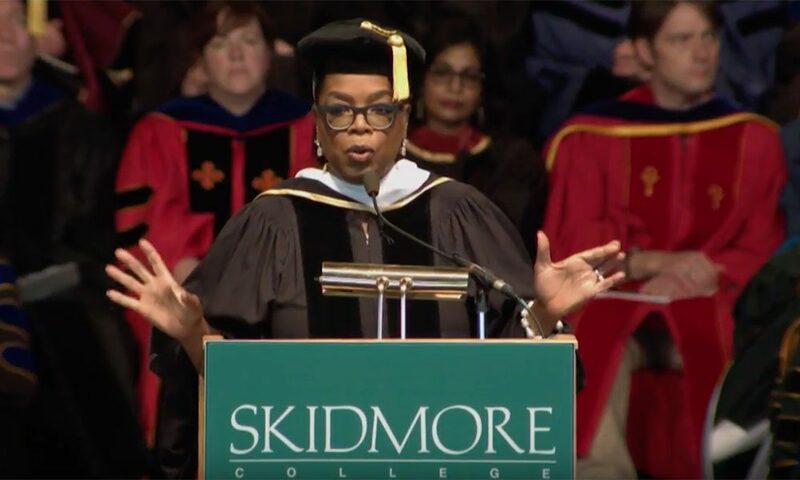 Did Oprah’s Skidmore College Commencement Address Hint At A Presidential Run? Maybe Not. Saratoga college speech might've been the chrysalis of the TV star's 2020 campaign. It doesn’t surprise us in the least that Oprah Winfrey’s rousing speech at the Golden Globes became 2018’s first zeitgeist-y “moment.” Her powerful words about fighting racial inequality and ending sexual assault have prompted a social revolution, media whirlwind and tidal wave of social media buzz. At the eye of the storm is a much-talked-about debate: Will Oprah run for president in 2020? She’s certainly hinted at the fact. But recently told InStyle magazine that she doesn’t “have the DNA for it.” And calls for her presidential bid are being rebutted with an equally passionate “NOprah” from politicians on both sides of the aisle. In a meeting about immigration reform on January 9, even the President himself weighed in on the matter: He said he didn’t expect Oprah to run, but if she did, he expected to beat her. She isn’t giving any sort of answer yet anyway, but it’s worth noting that, in her commencement speech to Skidmore College’s class of 2017, Oprah did say she makes every decision deliberately: “There is an intention that precedes every thought and action, and the outcome of your experience is determined by that intention,” she told Skidmore’s graduate class, just six months before the Golden Globes. “This principle of intention is what literally saved and changed the trajectory of my living, because I started to make my decisions based on what I intended, not just what someone else wanted me to do.” Could Oprah have been hinting at a presidential run in our own backyard, months before the Globes?